Welcome to Crackle & Pop! Founded in 2006 by Johnny Sangster & Andrew Smith with a small collection of instruments, some recording gear and a desire to be a community hub for affordable high quality audio projects, Crackle & Pop! has since grown to become a full fledged analog recording facility. 2018 saw a new chapter for the studio with an expansion into a larger space plus a huge upgrade to our signal path. We are now the proud caretakers of an original Spectra Sonics console built for Stax Records in 1969. 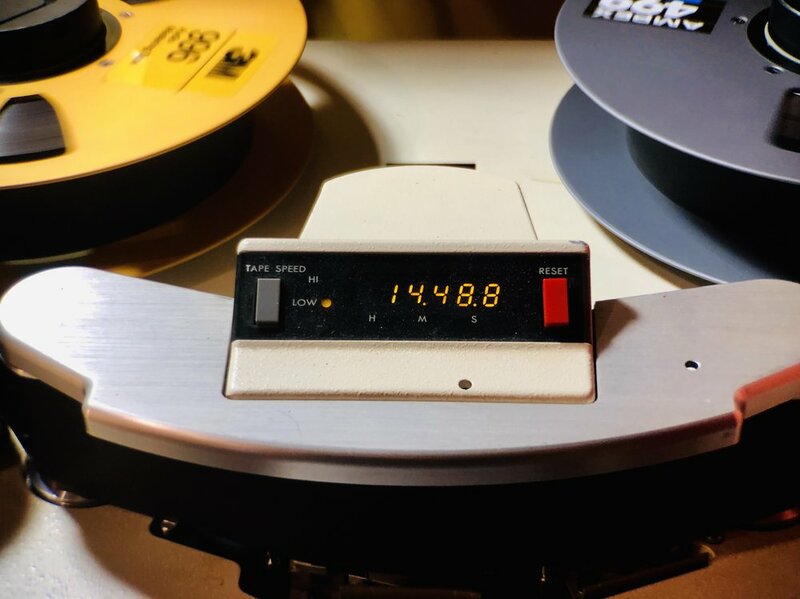 Also we can now offer analog tape recording with both 2” 16/24 track and 1/4” mix down decks. The studio has contributed to projects by Mudhoney, Maggie Bjorklund, Mark Lanegan, Earth, Jesse Sykes, Ken Stringfellow & Jon Auer, Cobirds Unite & countless others. We are proud to have become the home of many local producers & engineers. We've created the "Live @ Crackle & Pop!" video series supporting artists we love and taken on countless creative projects. Our Spectra Sonics Console was custom built for Stax Records in 1969 and has since been at Ironwood and Egg Studios in Seattle WA. It is currently undergoing a complete refurbishment with the expert help of Timothy Herzog. 2018 was a transformational year for Crackle & Pop! After many years in our cozy little room, the stars aligned for us to move the studio into a larger space. We raised a good part of the capital through a Kickstarter campaign and commenced construction of completely new space. We now have a fully realized recording facility that can be used in several configurations from loud to quiet. The rooms sound fantastic (thank you Ed Brooks) and the flow and feel of the place is exactly what we were hoping for. One of the features we are very excited about with the new room are the adjustable "wing" traps that lower off of our live room walls. Our live room with adjustable “wing traps”. Our Control Room - pictured here is our 1984 Harrison Raven Console. Our Booth which comfortably fits several players or a drum kit. We are extremely blessed to have an original Tim Kerr mural in the studio. Tim has been a friend and inspiration to us for many, many years and he kindly agreed to make a donor painting for our Kickstarter campaign. We didn’t realize how far above and beyond he would go. Celebrate Your Time Here! Read more about Tim Kerr here. 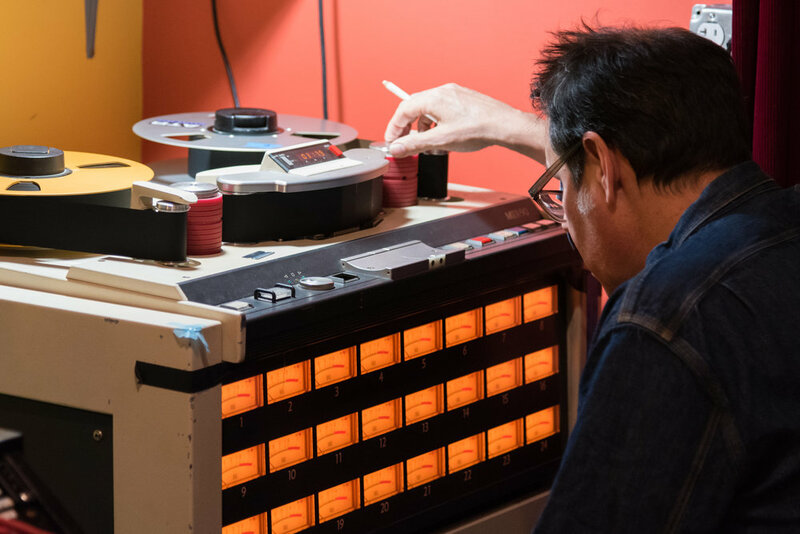 At the heart of our recording chain is our Spectra Sonics console built for Stax Studio in 1969. Our Harrison Raven offers the flexibility of a larger format console with 36 channels & 24 busses. We are proud to offer 2” 16 and 24 track analog tape recording. We can mix down to 1/4” 15 or 30IPS. For our digital chain have 40 channels of I/O with Aurora Lynx and Avid converters. Being avid DIY enthusiasts we have many custom built items at the studio. We monitor with Adam S3A and Avantone speakers. Mics by AKG, Coles, Royer, Shure, SoundDeluxe and more. Crackle & Pop! is the home of multi-instrumentalist and producer Johnny Sangster. As such many of his instruments live at the studio and are available upon request. We also have curated a growing collection of keyboards, drums, percussion instruments and toys. For a full list of what’s available at the studio click here. Full Instrument List. As part of our 2018 Kickstarter campaign to expand the studio, our supporters pushed our campaign over the goal to purchase a set of drums for the new studio. We are now the proud owners of a 1972 Rogers kit. We are proud of our real keyboard instrument collection. From our Emerson upright grand, to the Hammond A102, Wurlitzer 200A and on. The studio has many excellent options. One of the things we’ve always been proud of is our collection of great sounding amps and wonderful guitars. Check out the Full Instrument List for details. Over the course of our history we’ve had the pleasure of working with a diverse group of amazing artists. For a full list of who’s recorded at the studio click below. Rusty Willoughby - Wrecker of Hearts - Live @ Crackle & Pop! Curtains for You - Live @ Crackle & Pop! Rusty Willoughby - Too Early/Crown of Thorns - Live @ Crackle & Pop! Bronwynne Brent - Heartbreaker - Live @ Crackle&Pop! At Crackle & Pop! we welcome independent engineers. The following rates are for the studio without an engineer or producer. Please contact us for engineer producer rates. Crackle &Pop! is $300 a day or $30 an hour without an engineer. There is a 4 hour minimum for hourly sessions. For new engineers we recommend one of our folks to be onsite for setup. Contact us for rates. Full days take precedence over hourly sessions on the weekends. We might ask you for a deposit, depending on a few factors. If we do, the deposit is refundable up to 48 hours prior to the session. Otherwise we use your deposit to buy new mics. We sometimes have used tape to purchase and rental reels for sessions. Contact us about the current stock and prices. Crackle & Pop! is not responsible for your data. Expect to purchase two hard drives, one for a work drive and one for a backup for your session data. Johnny Sangster and Andy Smith are the founding partners at Crackle & Pop! Andy is our resident tech genius and “live @ C&P!” video guru. Johnny engineers and produces many records out of the space. Jon Roberts is our house engineer. He has many years of experience and has helped build the new space from the ground up. 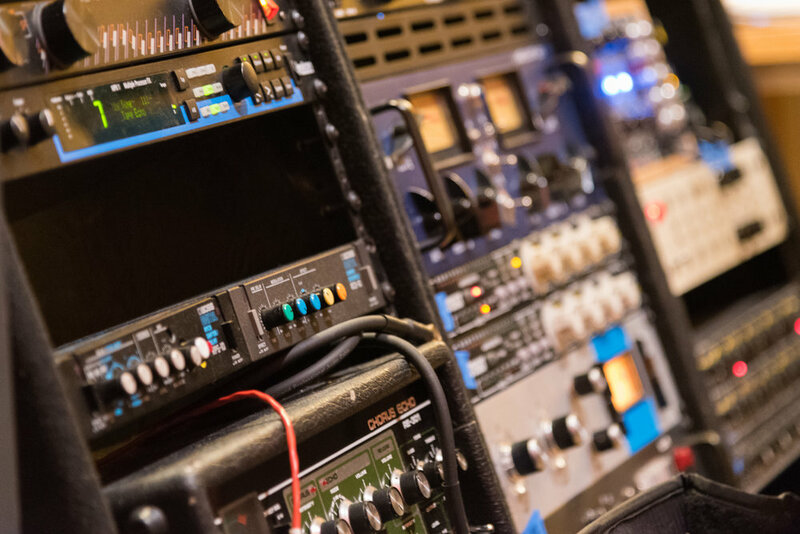 Other engineers who frequent the studio are Rachel Field (of Resonant Mastering), Floyd Reitsma, Matt Brown, Ryan Leyva, Randall Dunn & Matt Bayles. Any other questions you might have about working at C&P!